The knee is a complex hinge joint between the thigh bone (femur) and shin bone (tibia). The knee joint also includes the patello-femoral joint between the kneecap (patella) and the trochlea (groove) on the front of the femur. Ligaments can be likened to pieces of string whose purpose is to control and prevent excessive movement of joints. Ligaments are made of strong connective tissue (collagen). 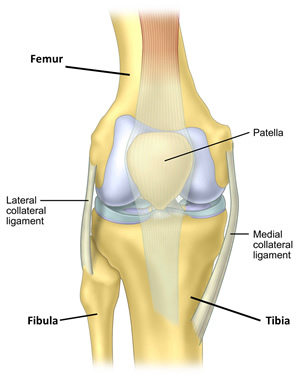 There are two main groups of ligaments in the knee that connect the femur to the tibia, the collateral ligaments and the cruciate ligaments. The two main groups of ligaments are the collateral ligaments, which are at the sides of the knee, and the cruciate ligaments in the centre of the knee. 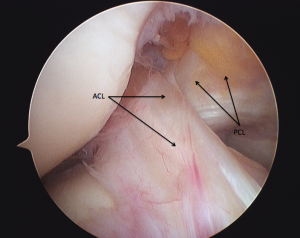 There are two types of cartilage in the knee, articular cartilage and meniscal cartilage. Articular cartilage covers the surfaces of bones. It provides a strong resilient and extremely smooth surface to allow the bones to move over each other. There are two ‘C’ shaped Meniscal Cartilages, the medial and lateral meniscii located between the femur and tibia on the inside and outside of the knee respectively. They have a number of important functions including shock absorption, lubrication, proprioception and stabilisation. However their most important function is as load distributers, converting a round (femur) on flat (tibia) bearing surface to a perfectly matched round on round bearing surface to a perfectly matched round on round bearing surface. When people talk about a ‘torn cartilage’, they typically mean the meniscal cartilage and not the articular cartilage. Two major sets of muscles cross the knee joint to provide the force for movement – the quadriceps and the hamstrings. These muscles are connected to bone by tendons. The extensor mechanism connects the quadriceps muscles on the front of the thigh through the patella and patella tendon to the tibial tuberosity of the tibia to straighten the knee. The hamstring muscles at the back of the thigh are the main muscles that bend (flex) the knee. A bursa is a fluid filled sac (normally containing only a tiny amount of fluid), that helps the movement of skin and soft tissues over bony prominences. There are a number of bursae around the knee. Bursae can become inflamed, inflammation of the prepatella bursa and the infrapatella bursa are called housemaid’s and clergyman’s knee.